The Japanese tradition of woodworking has some fundamental differences from Western woodworking. One of those fundamental differences is that Japanese saws cut on the pull stroke. Many people who are comfortable with the Western style of saw find this awkward at first, but there are some undeniable advantages. It is possible with a pull stoke saw to make the blade much thinner than on a push type saw, since a pull-stroke saw does not need to have any inherent rigidity. This allows the blades on Japanese saws to be dramatically thinner than even the best Western saws. The thin kerf of a Japanese saw means that less material is removed, which translates directly into less effort being exerted by the user. The teeth on fine toothed Japanese saws, are shaped differently than Western saws. On the finest quality saws, like those of Hishika, these teeth leave a glass smooth surface. Hishika makes high-end hand made Japanese saw in the best tradition of Japanese sawmaking, as well as more modestly priced machine made saws which are also the best in their class. The market for Japanese saws is dominated today by machine made saws, which are much less costly to produce, but a fine hand-made saw like the Hishika hand made saws do have distinct performance advantages over their machine made counterparts that will appeal to the connoisseur. Blade thickness tapers towards the back, and from top to bottom, to reduce friction and give the cleanest cuts. This is very time consuming and tedious to do on such thin blades, but it makes a huge difference in performance. The blade backbone is slightly curved for more effective sawing. This is very important for dovetail saws. The whole blade is hardened for flexibility as well as hardness. Blades are hardened one at a time, as has been done traditionally in Japan. Blades are hand-hammered to flatten and relieve stress, as was also done on Western saws until the mid-20th Century when cold rolled steel completely took over in saw making. This is one reason why pre-War western style saws are superior to any similar western-style saws made today. Blades are hand hammered to tension the blade so that it will remain straight as the blade heats up during vigorous use. 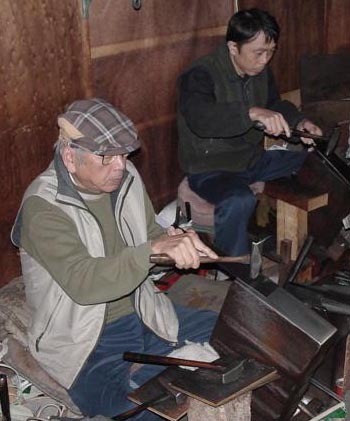 Hishika hand made saws are intended to be resharpened and to last a lifetime. Hishika Bessho Tara saws are a special extra high-grade hand made saw with very limited production. Click on Image to see the Hishika Bessho Tarro Hand-Made Douzuki. Hishika Douzuki (also spelled Dozuki in the US) Saws are Japanese rip-cut dovetailing saws. Douzuki saws have a rigid steel back and very fine teeth (20 PPI). The saw pictured above is the hand-made Hishika Douzuki. Click on the image to see the Hishik Bessho Taro (ultimate grade) hand-made Douzuki. Hishika Douzuki (also spelled Dozuki in the US) Saws are Japanese rip-cut dovetailing saws. Douzuki saws have a rigid steel back and very fine teeth. Click on Image to see the Hishika Bessho Tarro Hand-Made Ryoba. The Hishika Ryoba saws features a hand made saw blade hardened piece by piece by hand as has been done traditionally in Japan for centuries. The whole blade is hardened to have flexibility as well as hardness. The blade thickness is differentiated, i.e., tapering towards the back to produce friction-free strokes and the cleanest cut surfaces. The rip teeth start out more fine and get progressively more coarse towards the end. This is more pronounced on the Bessho Taro (finest grade) Ryoba. The saw pictures above is the standard hand-made Hishika Ryoba. The blade width tapers from about 2 5/8" to 3 1/4". The Bessho Taro is wider, tapering from 3 1/4" to 4 1/8". Click on the picture above to see the Hishika Bessho Tarro Ryoba. Rip teeth are progessively more coarse towards the end. SALE! Mini size for very fine work. SALE! The Hishika Kugihiki saws features a hand made saw blade hardened one at a time by hand as has been done traditionally in Japan for centuries. The whole blade is hardened for flexibility as well as hardness. The blade thickness tapers towards the back to produce friction-free strokes and the teeth are sharpened with no set to produce the cleanest cuts. Kugihiki saws are intended for flush cutting of pins and similar applications, and have a cross-cut tooth configuration. The blades are quite fragile and should not be used in applications that might over-stess them, such as cuts that are more than about a half inch in depth, except in very thin stock. Because of the way that the blade is tempered, it will break if too much stress is put on the blade. This is only an issue if the saw is used in a way for which it was never intended. Kataba saws have alternating rip and cross-cut teeth, allowing them to work effectively with or across grain. The Hishika Kataba saws features a hand made saw blade hardened piece by piece by hand as has been done traditionally in Japan for centuries. The whole blade is hardened to have flexibility as well as hardness. The blade thickness is differentiated, i.e., tapering towards the back to produce friction-free strokes and the cleanest cut surfaces. Proonly is a term that means "professional use only." This term, the origins of which I don't know, only seems to be used by Japanese sawmakers, but Disston used to mark their no-set saws to indicate that they were for professional use only Disston's wording was, "For Mechanicks, not Botchers." I just love that. Special Hardwood Optimized tooth configuration.